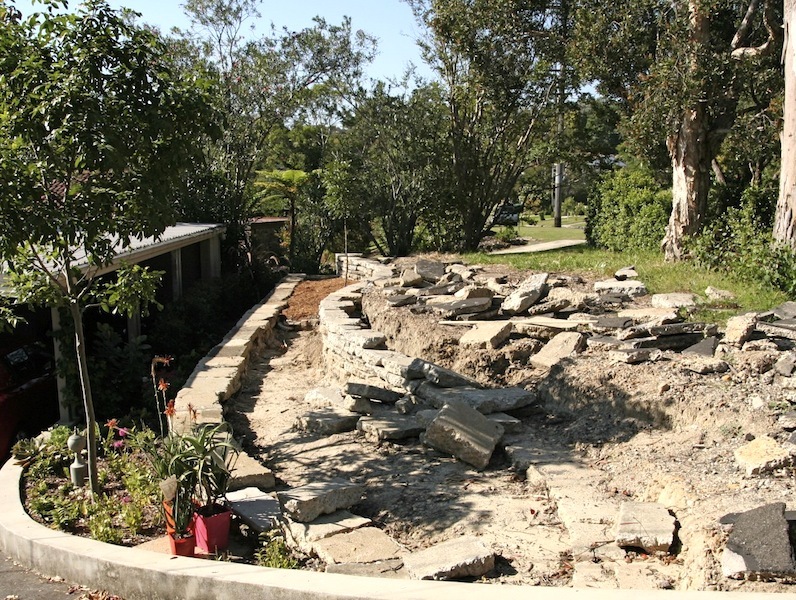 We needed some new, low retaining walls in our top garden. “I’ve been thinking“, I said to my husband. This phrase always strikes fear into the heart of my family, though I can’t imagine why. And my idea? Reusing old, broken up concrete to make the new walls. When I first ran the idea past a couple of designer friends they were distinctly luke-warm. “Instead of classy-looking real sandstone? Hmmmm………not sure that will be a look you’ll really want” said one. But I thought I could ‘see’ something beautiful in my mind’s eye. While excavating behind where the old, nearly-collapsing 2.6m (9ft) high brick retaining wall had been removed, we discovered where some previous owners of our house had chosen to put most of an original driveway, which had been replaced over 30 years before when the now-removed brick retaining wall had been built. Yes, there it was, as fill in the slope, with some pieces about a metre (3ft) square, creating huge voids beneath them. There was just no alternative – all of them would have to come out, or planting and maintaining the slope would be impossible. The landscape plan (helped along by my garden designer friend Arthur Lathouris – although I’m a designer by trade I find it impossible to design my own garden) called for two new walls, the lower straight and the upper with some gentle curves, but both with an end point that had to blend into the new, rendered concrete kerbing that edged the driveway. Plus we had to figure out a way to incorporate some matching steps up to the top level. Cutting up Adrian’s driveway. I think he said we could have it…. With lots of grunting, heave-ho, sweat and a bent crowbar, we managed to remove all the large concrete slab pieces from inside the slope. There was still considerable suspicion that my Grand Plan D was actually D for delusional, and it soon became apparent that we wouldn’t have nearly enough concrete to do the job. Not sending away concrete to landfill now became begging for other people’s concrete. Driving up the street a few days later, I noticed a neighbour had stacked pieces of sawn concrete from what had once been his driveway, and there were obvious plans to pull up more. A note in the letter box, a very surprised sounding ‘you want what?’ phone call and 5 trailer trips later, we had a base course for our first wall. But still we needed more. The concrete-for-reuse specifications were: no reinforcing mesh, a standard concrete ‘grey’ with no coloured oxides, and between 70-120mm (2¾”- 5″) thick, which dictated something laid more than 25 years ago. First we found a friend with an old concrete pad, revealed after demolition of his old shed, plus an old path. A hired jackhammer, lots of trailer trips and several aching backs later, we had enough to build the first wall. We developed an insatiable appetite for old concrete paths, particularly those old skinny path/driveway tracks so popular in the 1950s-70s. And each time we asked, the owner would agree (incredulously) and ask “but how are you going to cover up the concrete?”. When we finally bullied my friend Adrian into surrendering his old driveway, we were set. As I’d never thought of covering it up, this was a bit disconcerting. Was I building something that would be so bug-ugly I’d have to plant densely to disguise it or, worse still, render over the offending broken concrete slabs? 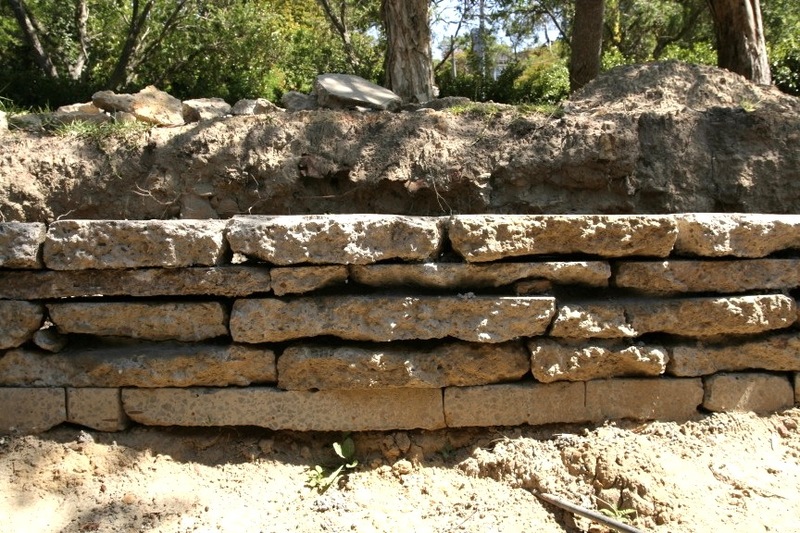 Construction was the same as a bookleaf dry stone wall, with the roughly broken 300 x 600mm (1ft x 2ft) concrete slabs laid stretcher-bond style, and the smooth sawn pieces from our neighbour forming the base course, where their textural difference would be less noticeable. Our soil is a very stable clayey sand, only barely removed from concrete itself (it hadn’t moved at all since the wall came down), so we didn’t need to make a strong base course. But in other soils you’d need to excavate a bit further and spread and compact some aggregate first. The base course was angled about 5 degrees backwards into the slope and had the occasional ‘deadman’ – a longer piece of concrete that extended back into the slope – for extra stability. Although 300 x 600mm slabs was the ideal, in reality we had to use up a lot of triangular and oddly-shaped pieces in the lower courses where only their leading face would be seen. As our acidic, sandy soil sets so hard, to create the level area for the upper wall we hired a small Dingo excavator. While the top wall was being built, I also started improving and planting in the lowest level so we could get some growth happening on our two small trees. As I wanted the wall to ‘weep’, there’s no waterproofing behind it. I also didn’t use any geotextile/fabric behind it, reasoning that the slight backwards angle and the wall’s thickness would be enough to prevent soil washing through, and that’s proven to be correct. 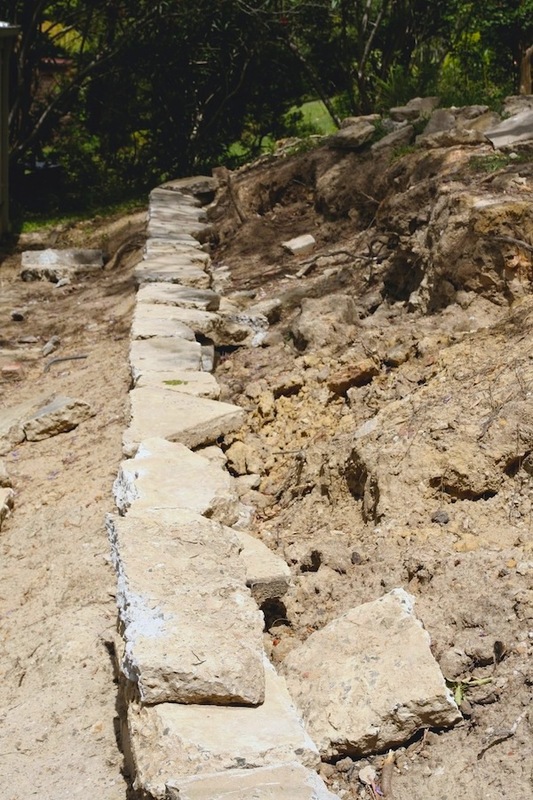 The tricky part was making up for variations in thickness; concrete from old paths is often only about 50mm (2″) thick but parts of the driveway were up to 130mm (5″). Added to that was the unevenness of many of the pieces, as cheaply poured slabs from several decades ago didn’t tend to have a nice smooth substrate. And some of the concrete had a lot more aggregate making it much darker than other pieces, so there was artistic blending of colours required as well. I was a bit worried that such uneven pieces could make it all look too haphazard, but trial and error and my husband’s skill created a great result. Although he has an engineering background and pretends not to be artistic you can see that’s not really true. An electric rotary hammer drill worked well to chip off the lumps and break up slabs that were too big into more manageable pieces. A fairly dry mix of mortar, concrete chips as packing pieces, trial and error, months of hard slog, a good eye and occasional “why am I doing this again?” finally got both walls built. And the result? Well even my long-suffering husband had to admit that my idea combined with his strength and skill had produced something really attractive, practical and unique. Visitors to the house expressed their admiration (and astonishment) at how good it looked. I hope it’s also more environmentally friendly, as it excluded the manufacture of new materials and prevented old concrete ending up in landfill. 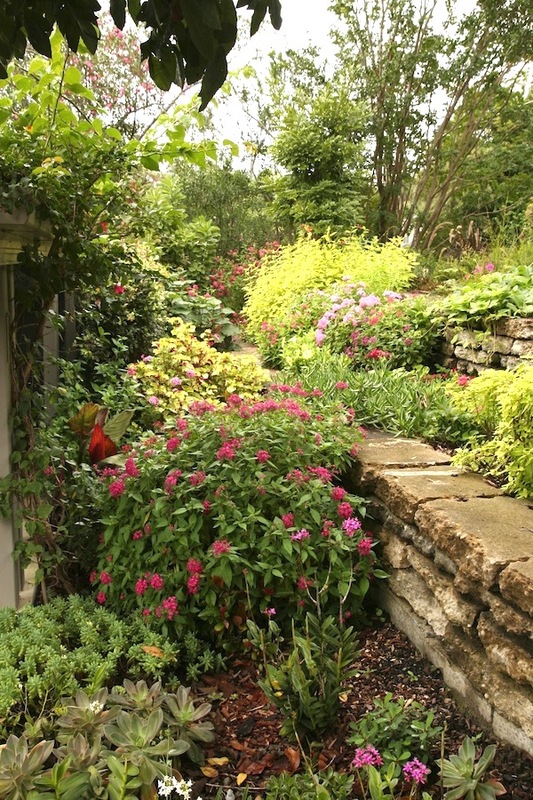 The wide top on the wall also makes convenient access paths through the garden. I do often look at these beautiful walls and wonder whether we could have incorporated some sort of water cascade into the design too. But maybe enough was enough. “I’ve been thinking” strikes fear into people everywhere :). But it was a good thought – and I enjoyed reading the post. Thanks Adrian. I think the steps are your old driveway! Great idea beautifully executed Catherine. It could have been a disaster in less artistic hands but you obviously had a vision for how it could work and followed through. Maybe my vision, but Tony’s artistic hands, I’d have to admit. What a fabulous idea! How much of this stuff is lying around and just looking plain ugly? Recycling has taken on a new meaning. And cost effective? – well even my husband would have to admit that! Perhaps you could hire him an electric jackhammer as a present on his next birthday…. No doubt it is artistic and inspirational and a touch Andy Goldsworthy! Thank you – that’s very flattering to be compared to the great AG. I’m hoping it will last a little longer though! A brilliant idea, skillfully and creatively implemented. 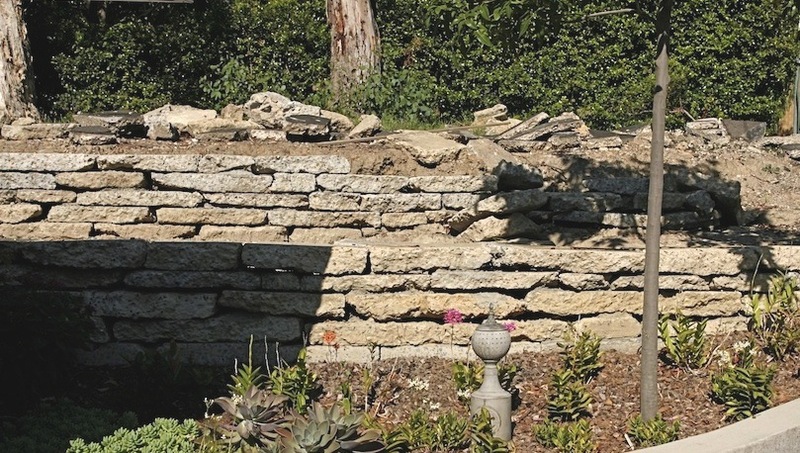 We have some retaining walls that look remarkably similar to yours – only ours are constructed from expensive sandstone! Quite honestly, with some weathering and those cascading plants to soften the edges, anyone would be hard-pressed to tell the difference. We should nominate you for some kind of eco design award. GardenDrummers should spread the word! Looks fab Cathy. Now I know what to do with all our concrete when and if we ever get around to replacing it with pavers. It’s just the right age too. I’ll second the eco-award nomination! Wow, Catherine, one of those projects that sounds ugly but looks beautiful! And the walls will only get better with time as mosses and lichens grow on them, and plants seed into crevices and spill over! And I know exactly what you mean about trying to find a use for an initially unwanted resource, then needing more: I’ve been collecting rocks from my neighbour’s paddock to extend my walls, seeing as I’ve run out of supply on my own block! Ha i have to laugh, at the council i work at i put the same thing around three rose beds but on the vertical, to my eyes they looked great i picked nice looking slabs that most people thought looked great. As is the norm with most councils if ONE person does not like it you pull it. So now all of the footpaths that the construction boys pull up go to landfill. Aren’t CEOs a wonderful lot. Looks fantastic. As well as the ecco award nomination, maybe your garden could be included in an Open Gardens event, complete with handout of all your watersaving ideas on show! Beautiful result for all that hard work. Looks great! We made a dry wall behind a tank with small rocks strewn all over our acre block! We used a wire cage to hold them in. My only worry is that the holes make a good hiding place for snakes. Hi Catherine, Thanks, you’ve given me an excellent idea for my raised veg garden! The old wooden fence posts I’d used to create the veg garden have rotted so I needed to replace them. 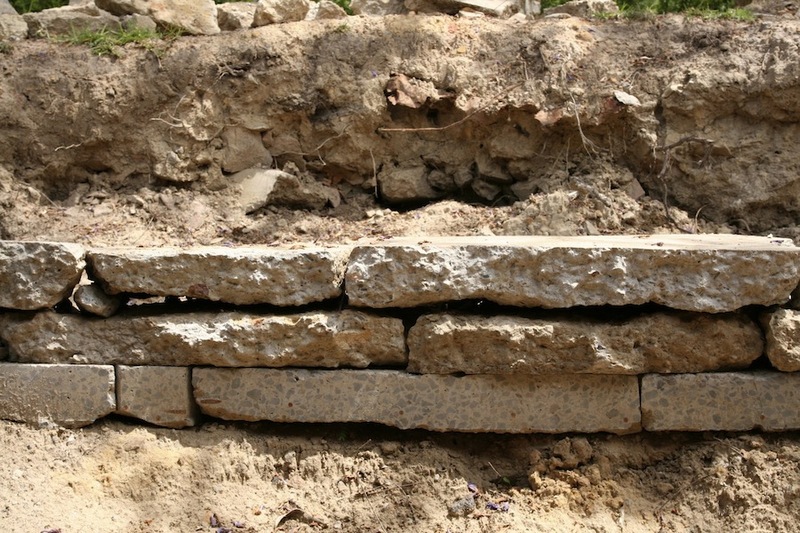 I have many cement strips 100x70cm thick and of various broken lengths (previously garden edging) which would be ideal as low walling, probably cemented together. Can’t wait to start the project! Wow…That looks great! I have some concrete that will need to be ripped up & that looks like such a great use for it. I like the idea of recycling it as it cost so much to get rid of it. And I am sure you know that your husband is not the only man to be fearful of the words ‘I’ve been thinking’. Absolutely love it!! As usual, your mind works in mysterious ways and performs wonders (plus Tony’s creative side and muscle). Also, as usual, I love the way you write about any topic. What a fantastic way to recycle and such an aethetically pleasing result! Inspirational! Thank you for the great story.. I really enjoyed your creation.And I am looking forward to recycling local concrete for my own project.Thanks for sharing! Thanks Sarah. It’s one of my favourite parts of the garden. Salvage style : 45 home and garden projects using reclaimed architectural details / Joe Rhatigan with Dana Irwin. Author: Rhatigan, Joe. — Irwin, Dana. Your project has both good aesthetics and environmental credentials. I am mid way through planning out a much smaller project and found your page whilst looking for ideas/inspiration. What started off a a way for me to get rid of/hide a load of broken paving slabs is now turning into some lovely raised beds – well in my head anyway! Cant wait to get started now I have seen how great it can look. Thanks for the inspiration. 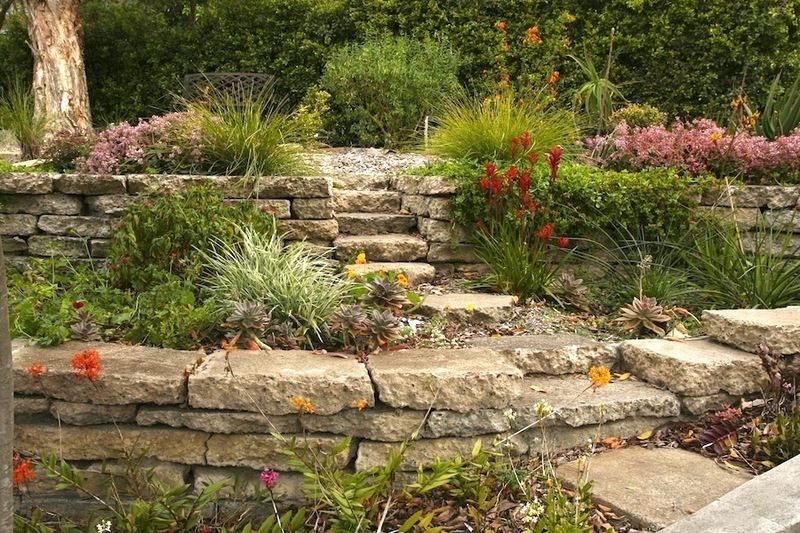 I’m so inspired : ) Where I live midwest of USA, stones are not readily available. The outrageous estimates for the ugly man made “stones” make my heart sink. I love the limestone look but my budget doesn’t. I do love the idea of recycling and I am now on a MISSION! That’s fabulous Coo! Yep, I think those man made ‘stones’ look pretty hideous too. I think you could also make an interesting gabion wall with broken up concrete. I’m still working on my curved gabion wall and as we were running out of stones, I’ve been filling the central section with broken concrete as it will be covered by nice sandstone. I was surprised to see that the broken concrete looks pretty good as a gabion wall packing too. And I promise – you’ll never look at an old broken concrete path in quite the same way again. There are just so many possibilities….! Thnks catherine. I love the garden. I too was looking to recycle concrete and use for a wall. Your advice is great inspiration. When you get it built, I hope you love your reused concrete wall as much as I do mine! It’s a couple of years on now since we built the first wall, and it’s weathered beautifully. This looks great, most especially the bottom photo. We have a concrete driveway that we are about to demolish. 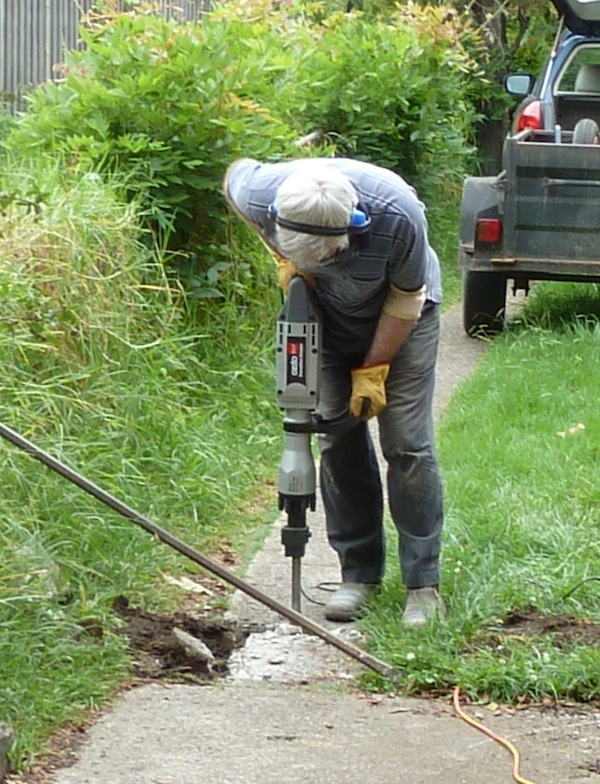 We were planning on using sledgehammers, but perhaps we’ll rent a concrete cutter. The best part is, we won’t need to haul all the concrete away — we’ll simply build walls with it. Thank you! Sounds like a grand plan Timothy! Unless you’re sure your old driveway has no reinforcing bar in it, I’d smash through a small section first to check. I guess you could still reuse it by cutting it with a concrete cutter but you’d have the cut steel to deal with too. A concrete cutter (also called a road saw) will give you a smooth edge on your pieces while a jackhammer will create the broken edge look like my wall. So wonderful! I want to create a greenhouse on a hill where the stone wall that holds back the hill is also a foundation wall of the greenhouse. Your article is just perfect, and cost effective and attractive, to boot! Thanks so much for all the great information!! A neighbor had a new concrete sidewalk put in and when I looked at the old concrete, I thought raised garden beds. My husband thought I was crazy. I’m going to show him yours. He’ll still think I’m crazy but maybe he’ll be willing to give it a try. Yep, my husband thought I was definitely crazy. But we now get so many compliments about our beautiful and unusual walls that he is convinced – mainly that it was his genius implementation rather than my genius idea that created such success. OMG! I love love love this. I am only missing the key ingredient. No…not the old concrete…the man to lend his strength to my hair-brain re-use ideas. Yes, I’m most fortunate in my selection of husband – for his strength, his abilities and, most of all, his willingness to be an active part of my crazy parade! You might be able to find yourself a contractor who’s prepared to do the jack-hammering and/or lifting and shifting for you. Try your local landscape training facility, like TAFE. Wow; exactly what I’d like to do too. Does your ground freeze? How did you use the mortar? In the pics the wall looks dry laid. Hi Steve, our ground doesn’t freeze and the wall is a dry wall. We did use small amounts of a very dry mortar mix occasionally, with chips of concrete, where the underside of a concrete slab was very uneven, or to make up the difference in thickness between two pieces. But not to stick the concrete slabs to each other. Very Nice , impressive , i am looking at doing the same but with old Kerbing stones turned on their sides. Inspiring! I’m going out back to look at that 1936 concrete in a different way. Glad to find your post. Thought I might be alone in my crazy idea to use reclaimed concrete. Beautiful garden you have created. I’m delighted to have another convert. The key is to find concrete without reinforcing mesh right through it. There’s another post on GardenDrum you might like, where James Beattie makes his path from reused cut-up concrete. http://gardendrum.com/2013/11/28/how-to-lay-a-recycled-concrete-path/. And I enjoyed reading your ResourcefulLady story about digging up your wayward, gone-feral rose. Some good advice there. Hi Catherine, We are in the Upper Blue Mountains, NSW, and have just taken up several old concrete paths, that we would like to give away. We have about 11 square metres of it. Many pieces are still intact rectangular pieces from the paths, and there are lots of irregular broken pieces (also great for crazy-paving). The paths would have been laid in the 1950s, so there’s no reinforcing mesh through it. Do you know anyone who would like to have it? They would have to collect it themselves. There’s about 3 tonnes of it. We are about to post a notice on a community website, but thought we’d ask you first. Many thanks. What a great way to reuse concrete! It’s awesome these slabs won’t end up in a landfill. 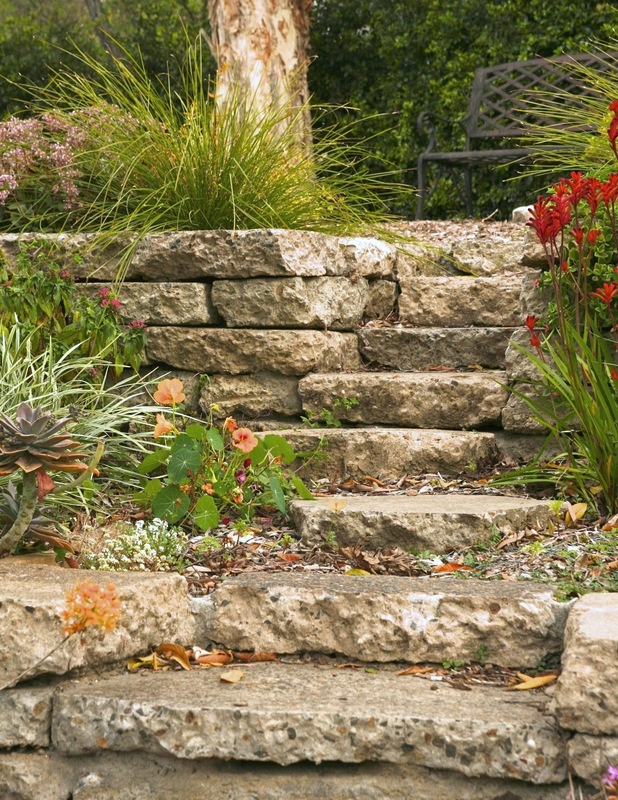 The wall and steps add so much appeal! What a great idea, and a gorgeous, quite natural look & feel. Aren’t hubbies willing victims more or less readily succumbing to the crazy ideas of their lovely wives ? Every morning I see such a chap in the mirror, and every time my sweetie has another of her ‘great ideas’ I try to just disappear into thin air…. Her latest idea – which I strongly support – was: let’s move from the city into the bush. So we started looking and came across a large timber yurt with several timber annexes, all in a very dilapidated state & what I now lovingly call our “project home for the not-so-faint-hearted” (aka a complete renovation & refurbishment; one must either be a complete idiot or adventurous & inspired to move there, esp. from a 1st grade island home with all the mod-cons). But: the kids are gone, 21,000 sqm of potential garden is waiting, sandy soil (how do I improve this ? ), a river flowing all year behind our block containing endemic rainbow fishes and the occasional platypus, heaps of natives, deadly snakes, a large fire pit with a spit for the occasional wild boar, the remnants of an old cottage garden behind the ruin of the old cottage on the block (doesn’t every proper garden need to have a ruin in it ? ), rainwater tanks, no electricity (which will change when we go onto solar), a tractor, a few rusty cars that have been offered to us as “garden ornaments”, and a large concrete terrace that so far I didn’t know what to do with it – but know I know where to get the materials for our Mediterranean dry-stone walls from. Bingo, thank you very much for the great inspiration, Catherine ! Perfect timing, my coming across your post Catherine. My 10 X 25 foot garage floor built 70 years ago must be removed and everyone insists, dragged to the landfill, which is a very expensive procedure for me and bad for Mother Earth. (Time and minor earthquakes have left it cracked and uneven.) Two sensible contractors have insisted that I forget any crazy idea to salvage the largest pieces of concrete for low retaining walls and garden paths. HA! Now I can refer them to your post, thank you so much Catherine. I am delighted Bev, that together we can send crazy rain onto your contractors’ sensible parade. 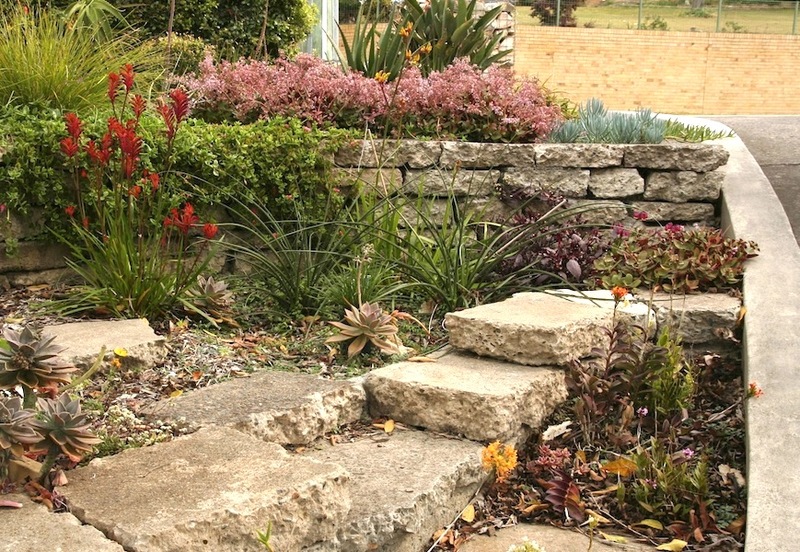 There are so many ways we can reuse landscaping materials with a little bit of flexibility and imagination. Unfortunately nearly all contractors and builders will want crisp, new rectilinear materials so you may find a stone mason more sympathetic to our ideas.